From today’s AikenStandard.com. To read the original story, click here. Aiken residents are helping spread the Gospel in the Central African Republic (CAR). Ten years ago Aiken Pastor Steve Taylor met Pastor Andre Mboi (pictured), president of 2,040 churches in CAR, at a conference in Toronto where Mboi served as an international representative for the Grace Brethren International Missions. Mboi shared his vision with Taylor to reach remote villages in the northeastern regions of CAR where no churches were present. Grace Brethren Church in Aiken began a ministry in the CAR by offering financial assistance and sending teams on mission trips. Over the past 10 years, the program in CAR under Mboi’s direction has expanded, adding 50 churches and establishing a teaching institute to prepare evangelists and pastors. “The average income in CAR is about $300 a year,” said Mboi. Since the creation of the institute in CAR, the Aiken church has supported 14 families through their three-year training program at the institute, as well as aiding in the building of the country’s fourth Bible institute. Once a year, teams from Aiken visit and work, teaching evangelists and teachers for work in the field. Once the evangelists complete their training, they are sent out into the eastern parts of the country to establish churches in different villages. In the past, the evangelists walked up to 150 miles to reach their destinations; however, last Christmas the church took up an offering and supplied 22 evangelists with bicycles to aid with their mission work. Last August Mboi was involved in a car accident and required surgery to regain the use of his wrist and hand. He arrived in the United States about three weeks ago and underwent surgery before visiting Aiken. He spoke to the Aiken congregation about his vision for the ministry in the eastern part of CAR. 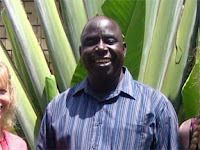 “My vision is to take the Gospel to Sudan, to the Democratic Republic of the Congo and to fill the east with churches. My goal is to start 10 new churches each year,” said Mboi. From his childhood, Mboi knew he wanted to be involved in the church. He was first introduced to the Gospel and to Grace Brethren Churches as a young boy living with his uncle. “When I was young, I loved to be in the church and work in the church,” said Mboi. After receiving his bachelor’s degree, the opportunity to attend seminary was presented and his dedication to the Lord grew. Mboi hopes to share the Gospel with as many people as possible. His visit to Aiken has reconnected the ministries and brought new life to the program.